The Cubs Den is a cute and cozy home on the main street of Gardiner(Scott Street). The Cub's Den is a clean 1 bedroom home, which is set up to comfortably sleep 4-5 people. There is a small living room, full bathroom, full kitchen and a fenced in back yard. 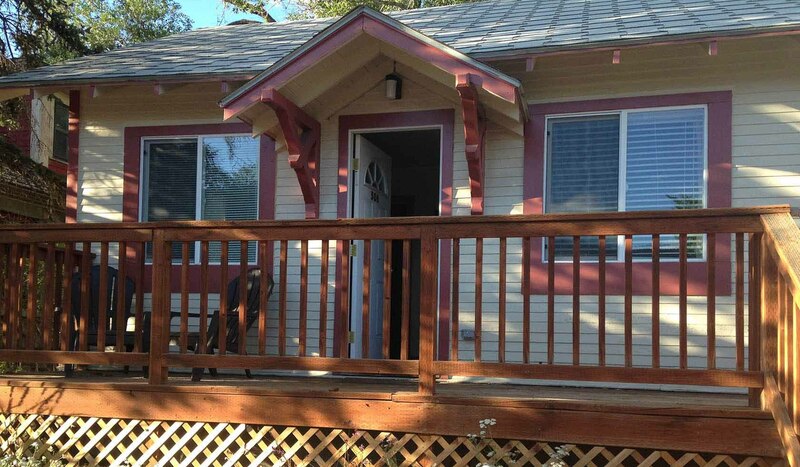 This rental is comparable to renting a hotel room, but offers the added bonuses of a house! This house is perfect for a family or group of 4 or 5 people who aren't looking for a large space. It has a great location on the main street in Gardiner and is less than 1 mile from Yellowstone Park. You can walk to the supermarket, the shops and restaurants, and the Flying Pig headquarters is just across the street! This is a 1 bedroom house, but we have added a queen bed in a nook in the living area. In the bedroom there is a twin-over-full-size bunk bed. The kitchen is fully stocked with all cooking items, plates, flatware, glasses and a microwave. Other amenities include high speed wireless Internet, flat panel television with satellite.